What on earth are ethical leather handbags? Many brands do it differently, but in the case of Vogatha, it means not using leather at all! Instead, the brand created a new material that is like leather in some ways. But it neither seeks to imitate it or recreate it — but find a middle path. The ethical leather handbags currently featured in the Vogatha collection are not actually leather. They feature a synthetic material that in many ways reflects the texture and look of leather. It’s also waterproof, which is a big plus for the durability factor. The material here is slightly stiffer than leather usually is. This has the advantage of allowing the bag to keep its shape better than leather handbags. It’s still flexible enough, however. The 3 Way Bag, for example, can become round or square depending on which snaps you close, without any strange distortion. The Vogatha 3 Way Bag here in its half round shape. You can see the natural way the fabric folds. 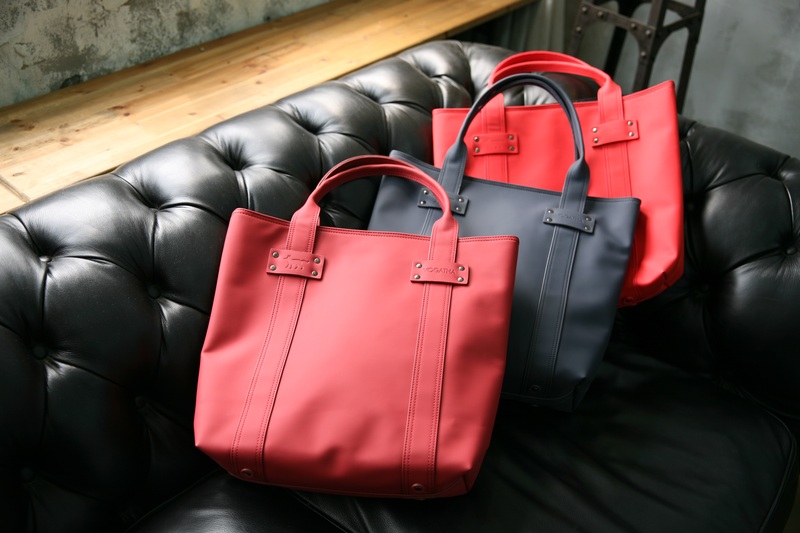 With Vogatha’s ethical leather handbags, the emphasis is also on the fashion side. There are many eco handbags that unfortunately “look” like eco handbags, that is, follow a certain expected aesthetic. That could be canvas or recycled materials. These handbags, however, are first and foremost fashion items. The colors are strong and the minimal lines are eye-catching and sophisticated. These are truly classy bags. They also happen to be eco friendly, but Vogatha is committed to ensuring that’s not the only thing they are. Vogatha’s collection of ethical leather handbags is currently still quite small, though the range of available colors is fairly extensive. There is also an eco leather backpack in the collection worth checking out. However, we can expect to see more models in the near future. To find out more about Vogatha and browse the collection, visit www.vogatha.com. Share the post "Ethical Leather Handbags From Vogatha"
Posted in Blog and tagged eco friendly bags, eco friendly fashion, eco friendly handbags, ethical leather handbags, leather free handbags, VOGATHA, vogatha 3 way bag, vogatha hera backpack, women's handbags, women's summer fashion, womens bags. Bookmark the permalink.